Orders that we receive after 2:30pm Central Time cannot be shipped until the next business day. Our main ship days are Monday's and Tuesday's. We do not want orders to sit over the weekend, to avoid delays we will hold and ship your order the next shipping Monday. 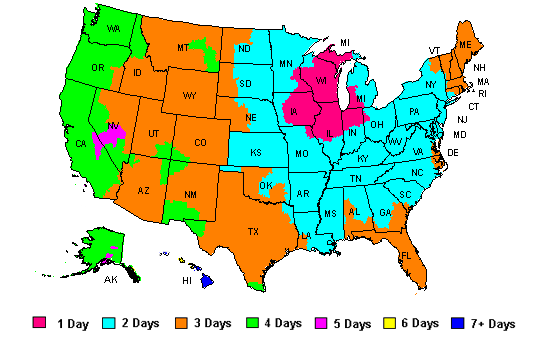 Please use the map below for approximate shipping times. If your order is traveling far and you would like to insure product quality and freshness, we recommend that you add one or more ice packs to your order. If you wish to protect your shipment from PORCH PIRACY, we strongly recommend that you Require Signature Upon Delivery. We cannot be held responsible for packages that are stolen that did not have a signature required. If you do not wish to pay for the extra security, we highly recommend shipping to a business or to a neighbor who will be home if you are unsure of the neighborhood. 1. Please contact us at 1-800-949-4791 or email us at info@ehlenbachscheese.com to discuss situation. Many situations can be handled immediatly over the phone.